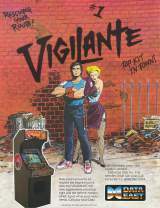 Arcade Video Game published 31 years ago by Data East USA, Inc.
Vigilante © 1988 Data East USA, Incorporated. Licensed from Irem Corp. For more information about the game itself, please see the original Irem entry. Sega Master System [US] (1988) "Vigilante [Model 7023]"
NEC TurboGrafx-16 [US] (1989) "Vigilante [Model TGX030004]"
PC [Desura] [US] (nov.2, 2013) "IREM Arcade Hits"